Santa Cruz Art: A PRE-CALL-FOR-ARTISTS The Regional Artisans Association is gearing up to open more artist venues and exhibits in the Capitola Mall. These would be “pop-up” fine art exhibits or galleries, which could operate from 1 month up to 6 months. These venues would be situated in unoccupied storefronts, fairly close to Art of Santa Cruz (which is next to Target). If we get enough interest from local artists to fill these spaces with art, we’ll be able to establish an “art corridor” in the mall which we can market to locals and tourists alike. All of this is in the early planning stages, but here are the preliminaries as we know them: 1. Participating artists would likely pay approximately $50 per month to participate in each pop-up venue, and there would be anywhere from 3 to 10 artists in each venue. 2. A 30% commission will be taken on all sales. All fees and commissions will go to pay rent and utilities. 3. Participating artists will be required to SIT THEIR GALLERIES or convince a friend, family, or representative to sit it for them. Staffing hours will be split among the artists participating in each venue. 4. 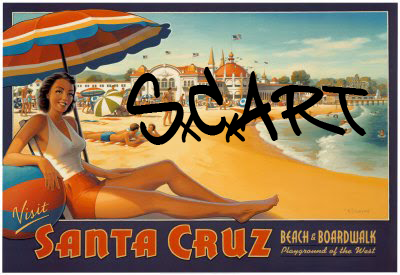 All sales will be run through the Art of Santa Cruz register. 5. We’d like each venue to be specialized (i.e., photography in one, wall art by theme or medium in another, sculpture in another, etc.). 6. Gallery hours will likely be limited to Friday, Saturday and Sundays: 11am to 6pm, though these could be expanded at the request of participating artists. This email is meant to establish whether there is enough interest in this opportunity to pursue it seriously. Please give this some thought, talk to other artists who you’d like to share an exhibition space with, and let us know if you’re interested. If we get enough interest, we’ll send out a formal call for artists. Email dawn@scottsvalleyartisans.com if you think you might be interested. A PRE-CALL-FOR-ARTISTS The Regional Artisans Association is gearing up to open more artist venues and exhibits in the Capitola Mall. These would be “pop-up” fine art exhibits or galleries, which could operate from 1 month up to 6 months. These venues would be situated in unoccupied storefronts, fairly close to Art of Santa Cruz (which is next to Target). If we get enough interest from local artists to fill these spaces with art, we’ll be able to establish an “art corridor” in the mall which we can market to locals and tourists alike. All of this is in the early planning stages, but here are the preliminaries as we know them: 1. Participating artists would likely pay approximately $50 per month to participate in each pop-up venue, and there would be anywhere from 3 to 10 artists in each venue. 2. A 30% commission will be taken on all sales. All fees and commissions will go to pay rent and utilities. 3. Participating artists will be required to SIT THEIR GALLERIES or convince a friend, family, or representative to sit it for them. Staffing hours will be split among the artists participating in each venue. 4. All sales will be run through the Art of Santa Cruz register. 5. We’d like each venue to be specialized (i.e., photography in one, wall art by theme or medium in another, sculpture in another, etc.). 6. Gallery hours will likely be limited to Friday, Saturday and Sundays: 11am to 6pm, though these could be expanded at the request of participating artists. This email is meant to establish whether there is enough interest in this opportunity to pursue it seriously. Please give this some thought, talk to other artists who you’d like to share an exhibition space with, and let us know if you’re interested. If we get enough interest, we’ll send out a formal call for artists. Email dawn@scottsvalleyartisans.com if you think you might be interested.